The Gyrls are back in town! "When I was in the War, I was like a little ant at the bottom of a ladder," says 82-year-old Hallie Sloan, a veteran nurse from World War II. "I didn't know what was happening. We didn't know the strategy or anything like that - about what was planned, how it was going to be done and what was involved. We knew that our job was to be on duty and be ready to work hard and altogether, and get on with it." Born Harriet Sloan, as a child she couldn't pronounce the "rs" so she changed it to "Hallie". That's probably the last time former Lieutenant Colonel Hallie Sloan changed anything because she couldn't do it. The young woman from Saskatoon so inspired by Florence Nightingale and her work during the Crimean War, graduated in 1939 from the Vancouver General Hospital. Enlisting in the Royal Canadian Army Medical Core, she served in the "8 CGH", the 8th Canadian General Hospital. Descendants of a military nursing service that dates from 1885 and the North-West Rebellion, 4,473 Canadian nursing sisters enlisted in the Second World War in the Navy, Army and Air Force. "There was a real air of patriotism," recalls Sloan, "a word not looked on very well today. We thought it was a just cause. There was a sense of taking part in a very large movement." "So often, families will say, 'Well, Dad never talked about that.' It's very common. I sort of think that people need to know, so that they can worry about what war is like...and hopefully do something about it." "The first [war] wounds I ever saw were from men practicing throwing live-hand grenades. One had rolled back into they bay where they were, and it had exploded," says Sloan. Based in Aldershot, a training centre for soldiers in both world wars, the 600-bed 8 CGH set up in a building said to have been designed by Florence Nightingale herself. Built of brick, the main section, "was quite antique," with big wide open rooms, high windows, and fireplaces to heat the wards," Sloan remembers. Sloan was drafted for the continent shortly after D-Day. Her ration pack included everything soldiers got "except rifles. Tins, boxes of cigarettes and matches—we called it going to Woolworth's. We had French invasion francs that were printed specially for the Invasion." She crossed the Channel with 59 other nurses in a landing raft tank. "It was so wonderful to find all our men from the unit, the doctors, the medical orderlies. All our equipment was there—for a 600-bed hospital—plunked in those fields near Bayou," says Sloan. "The logistics of moving just one small unit are just unbelievable." "It was like being in a MASH (Mobile Army Surgical Hospital) really because it was all under canvas—the operating room, the wards—the whole thing," says Sloan. "The nurses' tents were in an apple orchard!" Arriving during August 1945, the push to Cannes was already on. "We had so many casualties," she remembers, "They just poured in from the battles around us." For the first time, Sloan saw war wounds and casualties from the frontlines. She speaks at length about unforgettable burn injuries, particularly those of tank personnel. "They carried their own ammunition, their own petrol. If you have a tank and all that's inside.... So many Canadian boys died of just the burns, these terrible burns. I always marveled at how anybody got them out of the tank—the opening at the top isn't very big. It was dreadful." Along with fatal casualties and burn victims, the untold number of amputations stands out in Sloan's mind. But for all the horror, advances in war zone medical technology eased some of the problems encountered in the First World War or made them obsolete. "The most wonderful thing we had probably was penicillin. It must have saved thousands of lives," says Sloan. Developed in the North African desert during the war, the Tobruk splint is another. "Put on a bad wound in the femur, the upper thigh," says Sloan, the splint immobilized the leg using plaster but had a window over the wound so that it could be dressed. Notable for two particular benefits, the anesthetic Panethol rendered patients unconscious quickly without the side affects of previous anesthetics. Moving with the 8 CGH, Sloan survived the relentless bombing of Antwerp and was in southern Holland when the war ended. "Feelings are so hard to describe," says Sloan, when I ask her of particular memories. "It's a very personal thing. I know that I had compassion, a great compassion, for the people I looked after. I cried when they died. I saw every place we stopped, we had a small cemetery, and the padres buried people almost every day, I think. It was just part of the terror and the awfulness of war. I can't say that I recall individuals because it was all done so quickly. The turnover was incredible." But Sloan also recalls the good things about war. "There's no back-biting. You're all in it together, and you just get on with it. You share everything—your boxes from home, your magazines, your boyfriends...."
Speaking of boyfriends, I ask Sloan about the romanticised image of nurses, particularly during wartime, The English Patient for instance. "It's interesting that you should ask me about that," she says, "because they consulted me about her uniforms." Contacted by the New York-based costume company, Sloan sent pictures and word descriptions and later was contacted from locations in England and Italy. Though she found the story fascinating, "I cannot understand how one nurse would be left alone with one patient. It's a bit unrealistic," she adds. "I think nurses have always been romanticized to a certain degree." "We're not supposed to talk about war, you know. They say veterans never talk, so I'm being very immodest," says Sloan, chuckling softly. "So often, families will say, 'Well, Dad never talked about that.' It's very common. I sort of think that people need to know, so that they can worry about what war is like...and hopefully do something about it." 2013 Copyright Molly Amoli K. Shinhat. All Rights Reserved. Copyright for photographs of artists' works rests with the photographers, as indicated. If a credit is wrong, please drop me a line. 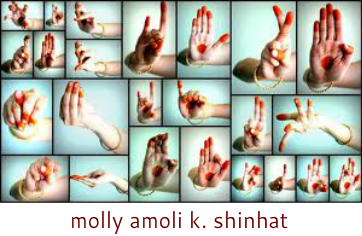 All other photography, including all the images in the photography section, are 2000-2013 Copyright Molly Amoli K. Shinhat. All Rights Reserved.